Mud fever is a common condition affecting horses particularly in wet conditions. The infection can stay dormant in skin, becoming active when the skin is compromised, usually by prolonged wetting. Spores germinate and produce hyphae (threadlike tentacles) that penetrate into the skin. The result is an acute inflammatory reaction. If the skin is injured or damaged . The organism enters the horse’s body through the broken skin, and multiplies in the damp, warm epidermal layers, starting an active infection. Generally unhealthy skin or a compromised immune system. Some horses with pastern dermatitis will be suffering from infestations of tiny chorioptic mange mites called called heel mange. Fungal infections can also be responsible for skin damage. Another form of pastern inflammation is caused by a disorder of the body’s immune system, which attacks the skin known as leucocytoclastic vasculitis and targets the unpigmented areas of the lower limbs and sunlight is thought to aggravate it. Back of pastern and heels are most commonly affected. White legs are most likely to be affected with large areas of skin becoming inflamed. Swelling of the lower limb and the horse may be lame. Heat, swelling and pain on pressure or flexion of limb leading to lameness. Diet. A horse with mud fever should be given a light diet. Avoid barley and high performance concentrates until the condition improves. This will ensure that the gut flora has the right pH levels. ie fewer acid loving micro-biology and more alkaline loving micro-flora. Veterinary prescription drugs may include corticosteroids, antihistamines, antibiotics, non-steriodial and anti-inflammatory drugs. Keeping the skin clean and dry is the basis of treating the condition. More specific treatment has to penetrate the pathogens under the scabs, so these must be lifted and removed at the start. 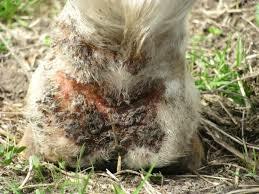 Some of the tougher scabs may need soaking or poulticing first to soften them, before they can be peeled away. Apply Hyperdula Spray. A blend of Hypericum and calendula to act as an antiseptic flush and treatment to the exposed pathogens under the skin. Some people find that colloidial silver and/or manuka honey are effective. Once the area is free from scabs, it should be washed — using either a mild disinfectant such as chiorhexidine, iodine wash or surgical scrub, or another a medicated shampoo — and then rinsed well. Once dry, there are numerous creams, lotions and emollients that may help. Zinc, castor oil, lead acetate and various commercial anti-inflammatory ointments can all play a part, but only if the skin is clean and dry underneath. To stimulate the immune system give 5 ml Equ-Ech (echinacaea ) for several weeks This will also act as an anti-biotic. Boost the horse’s immune system by feeding Echinacae, garlic and olive leaves. Although many horse owners are loathed to keep their horse stabled, once the infection is established it may be the only option. Rotate paddocks to avoid poaching. Introduce anti-bacterial and anti-fungal herbs to your horse’s environment ie a separate pharmacy paddock . Oregano is one such herb that can be introduced gradually. Be vigilant. The sooner you spot the first telltale signs of mud fever, the quicker you can take action and so prevent a lengthy, and costly, recovery. Allow the paddock to rest every seventh year and sow mustard seed which acts as a soil steriliser along with a nitrogen fixer like blue lupin then replant with an equine pasture mix. 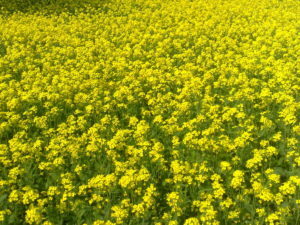 This paddock is being spelled for a year using mustard as a soil steriliser which has been reputed to be as effective as methyl bromide.